Last fall, Texana Hollis, 101, was evicted from her Detroit home after almost 60 years. A Good Samaritan from church took her in, while others tried to find funding to get her foreclosed home back. Unfortunately the building was in bad condition and condemned as not fit to live in, especially for the wheelchair bound great-grandmother. 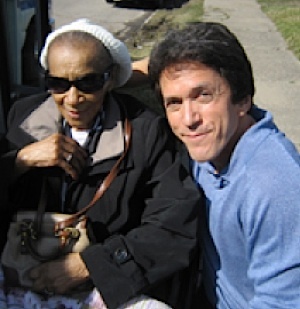 But, now her house is being given back to her – in better shape than ever – thanks to Detroit resident Mitch Albom, the best selling author of “Tuesdays with Morrie” and his charity for the homeless, S.A.Y. Detroit. In January, after hearing about Hollis’s troubles, Albom offered to buy the severely distressed property from the U.S. Department of Housing and Urban Development (HUD) for $100 and take responsibility for repairs. HUD agreed to the deal, and on Wednesday Hollis and Albom returned together to the home, which is being renovated with volunteer labor and more than $20,000 worth of materials paid for by Albom’s charity, S.A.Y. Detroit. Hollis had been evicted from the home after her son failed to make tax payments. Hollis’ house is getting a complete make-over, from walls to ceilings to appliances, using funds from S.A.Y. Detroit, which the author formed in 2006 to help the homeless with the Detroit Rescue Mission Ministries. Since its inception, S.A.Y. Detroit has raised nearly $2 million in funding for such projects as a Family Health Clinic, the first medical clinic for homeless children in America; Working Homes/Working Familes, which refurbishes decaying properties and fills them with deserving families; a new kitchen for Michigan’s Homeless Veterans, and a daycare center at COTS for mothers who are in shelters or treatment. Through Albom’s volunteer corps, A Time to Help, the organization has engaged over 6,000 metro-Detroit volunteers in projects throughout the city, and volunteers will put the finishing touches on Hollis’ house before turning it back to her. DONATE to the S.A.Y. Detroit effort HERE.